Producers of enterprise-class software and services for the management and manipulation of PDF files, Appligent has invented or been first to market with a number of products, including Redax, the original PDF redaction solution, in 1997. With dozens of software products and services, Appligent was looking to find a way to make better user of their content. They wanted to transform a simple, static marketing website into a continually-updated repository of all the latest information on all their products and solutions for both prospects and customers to utilize. "EditMe is a really easy and effective way to build a good looking and highly functioning website." After looking at 5 or 6 solutions, Duff Johnson, CEO of Appligent, launched a trial of EditMe, on the recommendation of a colleagues at AIIM, another EditMe customer. "A key criteria for us in the redevelopment of our website was easy editability by any authorized people on the team," said Duff. "We leverage both the unregistered, publicly accessible features, but also have customized policies to indicate someone has a particular level of access, and thus it's content driven - we tie their level of access directly to the area that they edit or manage." I had a chance to talk with Duff Johnson, CEO of Appligent and industry leader in PDF standards development, to learn how the company uses EditMe, whether they've met the objectives they set for themselves, and what has changed at the company since their adoption of EditMe. 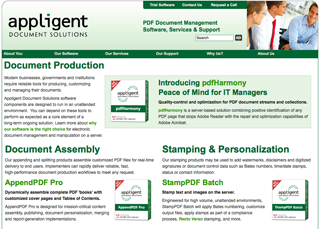 Appligent Document Solutions uses EditMe from EditMe on Vimeo. Get more people in the company to contribute to the website. Make daily changes to the site, not monthly or quarterly. Find a fully hosted solution with good value. A public website with defined areas of the site for each contributor to manage. Additional private EditMe wiki sites for internal collaboration at Appligent. Increased contributors from 2 people to 2 dozen contributors.